Never Gymless is dedicated to home-based workouts which negate the need for a fully equipped gym. 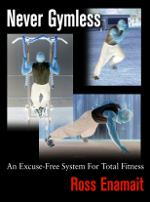 This book promises to be the most comprehensive bodyweight exercise manual on the market. Learn about bodyweight exercise for strength, endurance, and speed. All aspects of athletic training are covered with little or no equipment. A sample 50 day program is included in this 230 page e-book. 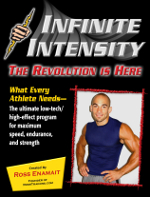 Infinite Intensity will teach you to utilize free weights and bodyweight exercise. Many athletes overemphasize strength training, which negates their conditioning. Others disregard strength work, thus fail to maximize their true potential. 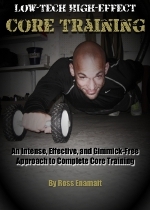 This program will teach you how and why to incorporate strength work and conditioning. A sample 50 day program is included in this 250 page e-book. 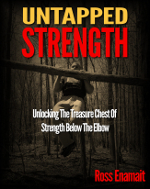 Untapped Strength is a 244 page e-book that is dedicated to lower arm training and overall strength development. Regardless of your goals, stronger hands, fingers, and wrists will enhance performance and reduce risk of injury. You are only as strong as your weakest link so don’t neglect the lower arms. Low-Tech High-Effect Core Training includes 3+ hours of content rich video. 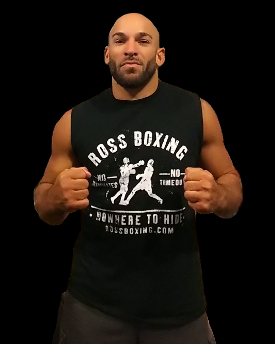 Throughout the footage, Ross demonstrates time-tested movements and methods designed to develop true core strength. Topics include free weights, bodyweight exercise, odd objects, and more. Progressions and programming advice are also included throughout this detailed video program. 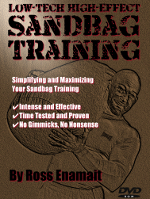 Low-Tech High-Effect Sandbag Training includes a 117 minute video and a 51 page e-book. Within the video, Ross shares the knowledge that he has acquired after training with sandbags for over 15 years . You will learn the most effective exercises for strength and endurance, along with information about how to successfully integrate these movements within a routine. 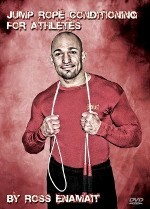 Jump Rope Conditioning For Athletes includes a 113 minute video and a 44 page e-book. Within the video, you will learn how and why the jump rope has stood the test of time as one of the most valuable conditioning tools available. No other conditioning tool will simultaneously develop so many attributes (ex. coordination, agility, footwork, balance, etc.). Full Throttle Conditioning includes a 108 minute video and 91 page e-book. 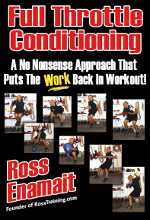 With this package, Ross gives you a backstage pass to his conditioning dungeon. Watch how he takes simplistic tools and creates intense and effective conditioning workouts. Expect to be challenged, as you learn a proven, effective, and efficient conditioning system. New apparel is now being outsourced from the USA and Europe. Several logos and styles are available. Please let me know if there are any additional styles that you’d like to see. Iron Woody Bands are continuous loop bands. They are useful on their own for several strength based movements (ex. good mornings, chest press, etc.). They are also useful additions to a powerlifting program (ex. dynamic bench work and reverse band benching). Bands can also be useful in rehab settings and to assist with bodyweight movements that may otherwise be too difficult (ex. band assisted pull-ups).